3. What does demulsibility testing look like? 4. How do you restore demulsibility? Demulsibility is the ability of oil to separate from water. Oil and water naturally separate because like molecules attract each other. Oil sticks with oil, water sticks with water. Oil is hydrophobic or "afraid of water," which is a benefit when it comes to fluids like turbine oil. So, oil has a characteristic of demulsibility -- it naturally separates from water. However, it can also be hygroscopic, meaning that turbine oil also has the ability to naturally attract and hold water. Because turbine oil is both demulsible and hygroscopic, it has a delicate relationship with water. Some amount of water is okay and to be expected in turbine oil. This water is held in the oil, much like humidity is in the air. It's called dissolved water and it's not visible to the eye. However, when oil reaches its saturation point, it is no longer able to hold water in a dissolved state and the water starts to separate out from the oil. This water, which you can see, and which often collects on the bottom of the reservoir and is drained off is called free water. 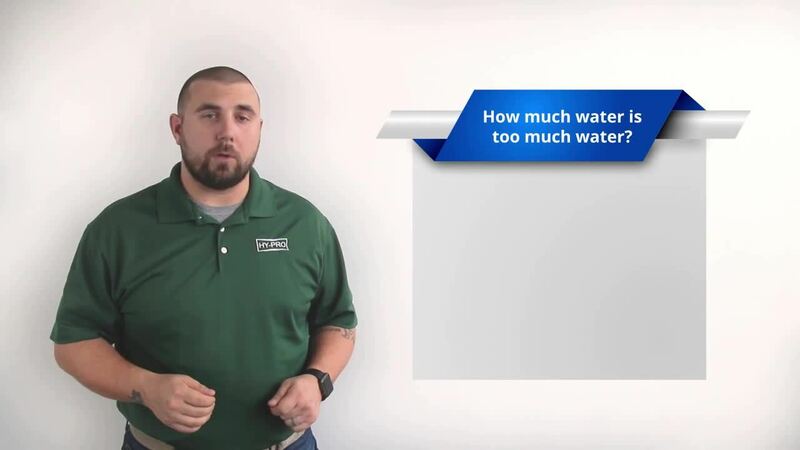 Free water and dissolved water have their issues, but as long as the oil's demulsibility is good, there are solutions to getting rid of this water. The problem comes with emulsified water, which happens when the oil's demulsibility is failing and the oil becomes unable to separate from the water. Emulsified water can cause all sorts of problems, from oil falling out of spec and needing to be condemned to issues with viscosity, acid formation and varnish. Some turbine manufacturers recommend keeping water levels well below 500 parts per million or 0.05 percent to avoid condemnation of oil, while ASTM D4378-08 states that at 1,000 PPM or 0.1 percent oil should be condemned. Because there is no absolute standard, it's important to monitor your oil. To ensure proper lubrication, the water level in the oil should be below saturation to avoid the presence of free and emulsified water. Demulsibility falls into two categories: good or bad. To test for turbine oil demulsibility, we use the industry standard test ASTM D1401. To start, we take 40 mL of sampled turbine oil and add it to 40 mL of distilled water and mix the two for five minutes. Once this period is done, we monitor the ability of the oil to separate from the water. Every five minutes, we need to record the volume of oil, volume of water and volume of emulsion present. The test concludes once less that 3 mL of emulsion is present or 30 minutes has passed, whichever comes first. We'll cover how to record the results in our next video. Losing demulsibility can be disastrous for turbines. Emulsions can destroy critical turbine components because they no longer contain the lubricating properties necessary for operation of a shaft and bearing. An abundance of water can lead to acid formation, which is the precursor of varnish, and very difficult to remove from systems. Not to mention the cost that comes from having to condemn inefficient, water-logged oil and the resulting costly downtime of the turbine. Demulsibility is essential to efficient turbine oil operation. When demulsibility is lost, there are several solutions for restoration. Two solutions involve topping up oil with alternative lubricants or aftermarket additives, but we've found these approaches complicate the chemistry of the oil, resulting in compounding issues. We've found that the best solution is to not add anything to the oil, but to take away the breakdown products that cause poor demulsibility. This is accomplished through ion exchange resins, which rely on adsorption and can be engineered to remove contaminants and restore turbine oils to a "like new' state. In our testing, turbine oils with failing demulsibility that have been treated with ion exchange technology regain the oil-separating abilities of new oil. In fact, in a lab-scale treatment of 14 different in-service steam turbine oils, our ion exchange technology was able to restore demulsibility in these degraded oils at an average of 93%. Beyond the dramatic improvement in demulsibility, ICB technology can also include varnish removal and prevention, prevention of AO additive depletion, removal of acids and metal ions and, most importantly, oil that lasts the life of the turbine. We hope this video has been helpful and informative. If you have any questions on how Hy-Pro can help with restoring demulsibility in your turbine oils, contact us at info@hyprofiltration.com.